In “Brave New World,” Aldous Huxley offered a parable for not only his generation but for those to follow. 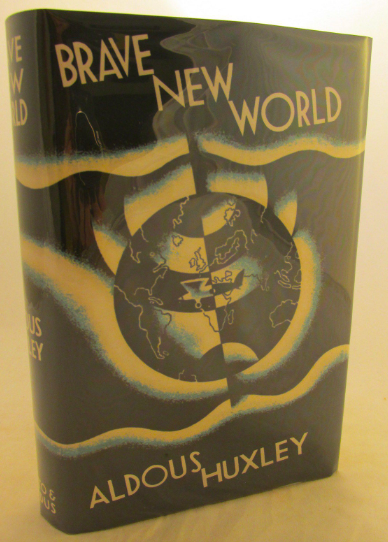 “Brave New World,” in its original British edition. 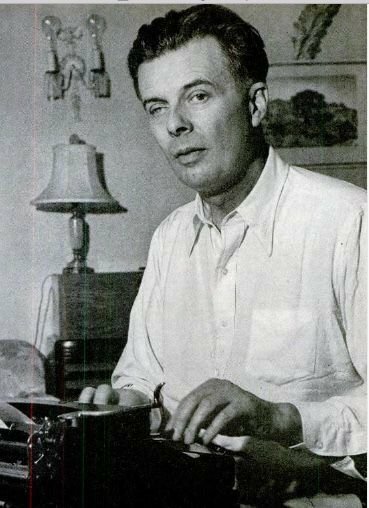 Aldous Huxley’s 1932 novel “Brave New World” is back and more relevant than ever. The title alone is a meme for our genetically engineered, social media besotted society, where individuals speak as “avatars” and conversations between family members take place on a touch-screen keypad. Like another futuristic fable of the time — Herman Hesse’s “Steppenwolf,” in which citizens strive to stop the inexorable flow of technology by aiming pistols at drivers of automobiles — Huxley brings a mix of highbrow humor, stunning wordplay and science-fiction narrative decades before the term science-fiction was even coined. The term “Brave New World” is probably as abused as any cliché in modern language. Take a look at today’s headlines — not just news, but sports and entertainment. There are pages and pages more. In Huxley’s brave new world, pregnancy and birth are mechanized and women are designed to provide the eggs for the next generation. Babies are “decanted” through the “Bokanovsky process” in bottling-rooms, assigned to ranks from the elite Alpha-Plus to the nearly subhuman Gamma-Minus. Time is measured from the introduction of Henry Ford’s first Model-T, inspiring the supreme being known as “Ford.” Techniques to ensure uniformity of caste are gruesome precursors of the most selective genetic engineering. Unorthodoxy “strikes at Society itself.” (capitalization is Huxley’s). As an Alpha-plus, Huxley’s protagonist Bernard Marx (the name threw me for a loop) is predestined to a life of pleasure and privilege. But he yearns to experience a world outside of the strictures of his world, “where every man, woman and child” is compelled to consume so much a year in the interests of industry. But the character’s stubborn quest — or is it simple curiosity? — takes him to the “reservation” in New Mexico where he encounters a “savage” named John living a pre-civilization lifestyle, isolated in the desert outside the purview of the new world and its cookie-cutter genetics. John is recruited for a debut in the Brave New World, cast as a sideshow freak. Huxley’s vision predates brainwashing, operant conditioning, subliminal seduction, verbal cues and repetitions by decades — now all part of our daily world as we turn on the television or radio, along with the use of psychotropic drugs and narcotics from Prozac to Zoloft. “A masterpiece in the age of anxiety,” Le Guin concludes. Sober thoughts for a new year as we stand at a national launchpad of uncertainty. Huxley's message to the world: angst or irony? When we say "brave new world," what do we mean?